September is that perfect time of year; the sun is still out and shining, but the weather is cooling off so we can start adding layers onto our favorite looks. I like to introduce fall-influenced style with my current summer wardrobe through layering tricks. Taking a favorite summertime staple breezy tank top and popping a blazer over that go-to piece creates a necessary transition from one season to the next, while still utilizing your current summer wardrobe. 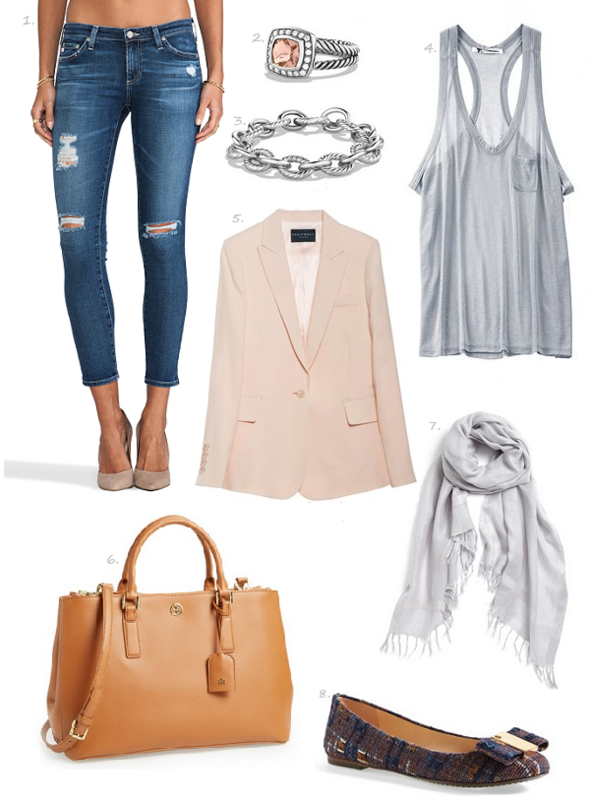 A softly colored pastel blazer is an on-trend color choice for fall and pairing it with varying shades of grey creates an easy to wear fall color scheme. Using neutral tones with light shades is a simple way to balance colors, while adding in a touch of fall through a tan leather handbag and tweed flats bridges the gap from light, frothy pieces that could have looked too “springtime weather”. Instead these touches of light and heavy fabrics and colors make the entire ensemble worthy of an autumn breeze.